Lazy Smurf lives in Texas and blogs over at lazysmurf.wordpress.com ...after she has had a lot of coffee. One of my favorite veganmofo themes this year is Kelly Peloza’s Seitan Beats Your Meat. All month long she has been posting amazing Mad Men inspired recipes and photos and since I recently just re-watched the whole show it’s super fresh in my mind. It’s so fun to relive the whole show through vegan food! 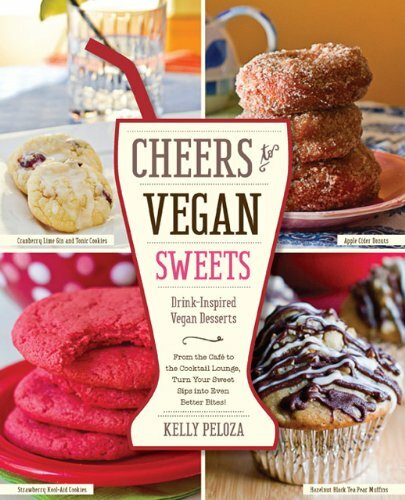 Kelly is also a cookbook author and her newest book “Cheers to Vegan Sweets” is going to be available November 1st. All the recipes are inspired by cocktails like Bloody Mary Biscuits and Margarita Ice Cream or beverages like Apple Cider Donuts & Mexican Coffee Truffles. I’ve looked through the book and it’s gorgeous. There are full-page photographs throughout and the chapters are set up intelligently into sections like “The Café”, “The Lemonade Stand”, and “The Cocktail Lounge”. Even though the book isn’t available until November 1st Fair Winds is giving away a copy to a luck mo-foer with an address in the US, Canada or the UK. All you have to do is tell me a cocktail or beverage that should never ever be turned into a dessert. Like a Kombucha filled doughnut. Please leave an email that you check in the comments too! 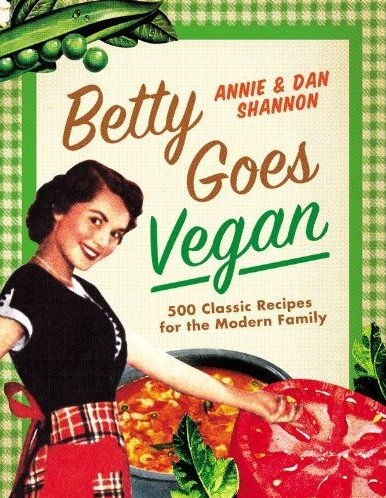 GIVEAWAY – I <3 Veganmofo! This contest is closed I think for a many of us Veganmofo is a time to do something that we would never, in a million years, otherwise do. I’m thinking of Laughrodiasiac’s vegan dessert trifle…with beyond meat beef tips or Mo’s The Winchester Oklahoma Bacon Fatty Melt Layering System. Whether you are making ice cream every day like Killer Bunnies or Eating Broccoli Soup Tacos like The Lonestar Plate, I want to know about it. TO ENTER TO WIN this lovely cross stitch from teenytinytantrums. Comment below (with an email address you check) What’s the most ridiculous thing you’ve done or read about for veganmofo? And sorry but this one is open to US only! I have had an exhausting last few days and I would love nothing more than lay around eating soup and watching movies. Today meshell in your city did a round up of her ten favorite soups. The siesta taco soup from Betty Goes Vegan sounds like the perfect thing since it’s about sleeping and tacos, what a combo! The only thing more comforting than soup is perhaps potatoes in all their starchy soothing glory. Eating Appalachia posted a recipe for smashed green beans and potatoes that looked like a wonderful comforting mashup. About the only thing better than eating those two meals would be getting my mom to cook for me, especially since her meals always include fine wine. Vegan Eats & Treats posted her mom’s go to Mexican bean salad and it reminded me of picnics of the past and it made me miss my mom. If you are going to be laying around anyway you may as well watch a ridiculous movie that you can laugh at the whole way through. Reading Don’t Eat Off the Sidewalk’s recap of Showgirls in her dinner and a movie post reminded me that I don’t even have to make people come over to watch movies with me in this day and age. We can just twitter about them and stay pajama fresh. Movies are better with popcorn and way better with Chili-Cheese Popcorn, Your Mom’s a Vegan adapted a recipe which looks like perfect movie fare. Maybe I’ll make it tonight. And if you didn’t get the title of this round-up please refer to the video below. THIS GIVEAWAY IS CLOSED. THANKS FOR ALL THE FUN ANSWERS! I love making pies in the summer even though it’s a thousand degrees in my kitchen. The only thing better than a freshly made cherry pie is maybe a peach pie. Or a tart made of fresh tomatoes from the garden. It’s hard to say. Then we turn the corner into fall and it becomes all about the apple pie and then the holiday sweet potato pies and pecan pies. In the dark of winter I love nothing more than a comforting shephard’s pie or a pot pie. Dynise Balcavage’s new book has all of these pies and more and I can’t wait to get my hot little hands on it. There are all the traditional pies I mentioned, quiches, creamy pies, tarts, raw food pies, and even imposter pies like whoopie pies and pizza pie and savory pies like “Hashbrown Crusted Breakfast Pie” & “North African Inspired Kale Pie”. I could eat nothing but pie and be completely happy and soon you can too because Fair Winds Press is giving away 4 copies of the book! Also I’m excited to let you know that the book will be available internationally so everyone can participate. To enter just comment below, with an email address that you check, and tell me about your favorite movie, tv show, song, painting, multimedia installation, art work, or any other media about pie! And pizza counts. The best entries will win a copy of the book. With all the taco cleansing and ice cream eating I’ve been doing these last few weeks of Veganmofo, smoothies are about the only way I’ve been getting my RDA of nutrients. Adding Navitas Natural superfoods to my smoothies makes me feel like a super smurf. According to their website, their mission is to “bring energizing superfoods to North America to invigorate the modern ‘Western’ diet. 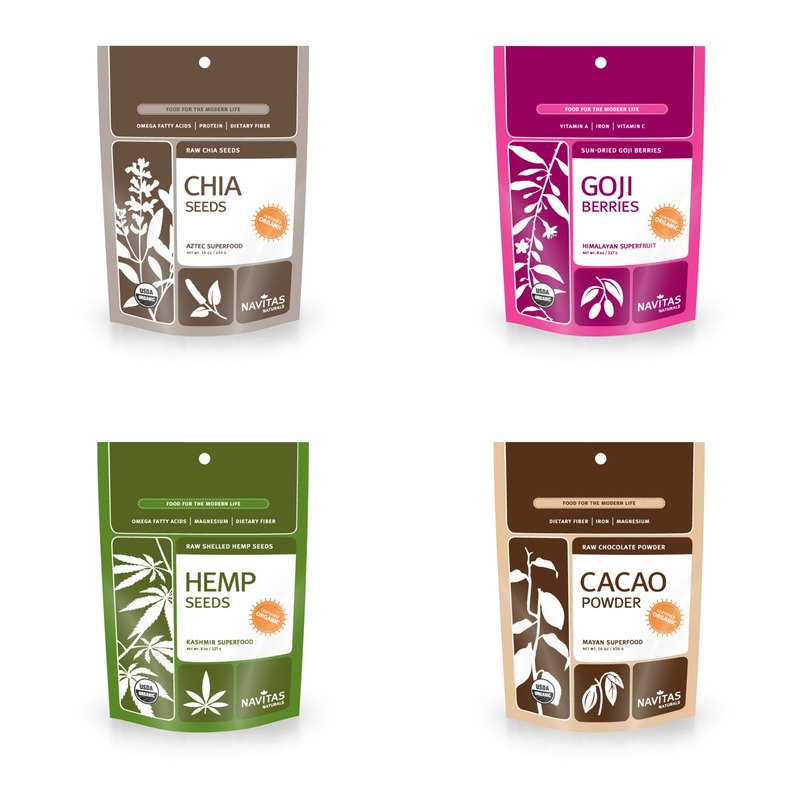 Our organic superfoods come from ancient cultures around the world where they are traditionally used for both nutritional and medicinal purposes. Health-conscious people choose our nutrient-dense superfoods because they are an abundant whole-food source of antioxidants, protein, essential fats, vitamins, minerals and other key nutrients.” They also add a lot of extra flavor. I recently acquired Kathy Patalsky’s lovely 365 Vegan Smoothies and I’ve learned lots of different ways to add these to my smoothies. My favorite is the Cacao powder, it adds so much more chocolatey flavor than the nibs. The hemp seeds and the chia seeds are both excellent for adding some omega-3 fatty acids into my body and goji berries are full of all kinds of magic. And they are delicious. Navitas has tons of different options too, from camu powder, to dragon fruit, and wheat grass you are sure to find something to wake up your smoothie. 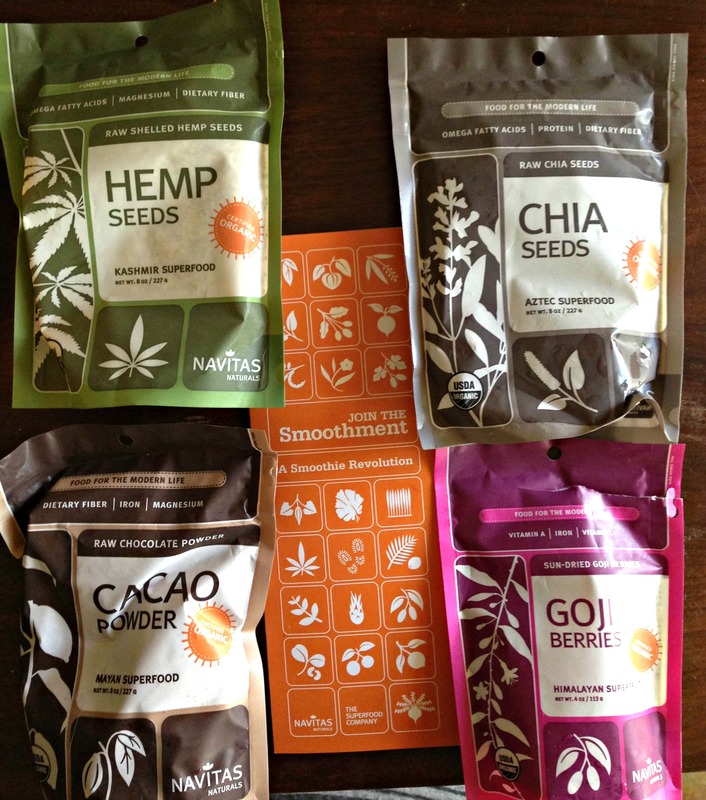 Navitas has agreed to send one prize package (of all of the above) to a veganmofoer with an address in the US or Canada. TO ENTER: All you have to do is comment below with a link to a smoothie you have blogged about or that another veganmofoer has blogged about and tell me the name of it too. Please also add a valid email to the comment form that I can actually contact you with. My favorite product to come out in this last year isn’t some cheese or meat replacement and it’s definitely not an über healthy raw concoction. No my friends, the Earth Balance Puffs have quickly climbed to the top of my snacking desires. The aged white cheddar is shockingly realistic and the puffy crunchy texture is snack food at it’s finest. And they are even gluten free! I have long been a fan of Earth Balance products, their vegan buttery spread is a staple at our house for everything from homemade hashbrowns to cinnamon raisin bagels and the sticks are so helpful for Christmas cookie baking sessions. Lately they have been coming our with tons of amazing new products like coconut spreads, mayo-like dressings, and a range of soy milks. TO ENTER If you would like to try one of the new products, or want to stock up on one of your old favorites they are sponsoring a giveaway today for 5 VIP coupons that will get you any of their products for FREE. All you have to do is comment below with a link to a new blog that you have discovered during this veganmofo. I will randomly pick a winner at 11 AM CST September 13. Please make sure you leave an email too, in the commenting form that I can actually contact you with and have either a US or Canadian address that Earth Balance can send the coupons to.